Ingrid Riga Rhind was one of the first members of the Museum. She joined the staff from 1996 – 2009. 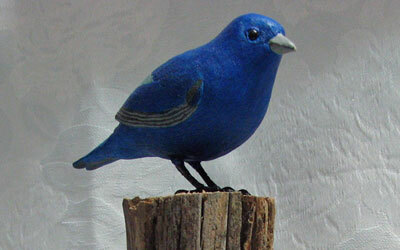 Impressed by Bob Spear‘s skill, she began studying wood carving with him. During her time here, her work contributed to the collection in numerous ways, in addition to her curator duties. Ingrid created the “Raptors Above” exhibit that is suspended over the “Nesting Birds” exhibit on the second floor. She helped Bob Spear with the initial development of the Wetland Diorama exhibits, and her carvings can been seen there. 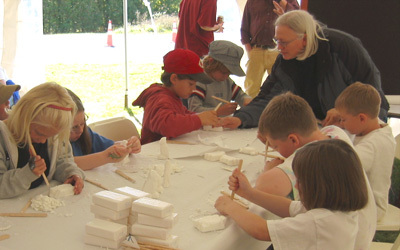 She also produced illustrations of birds for Chip Notes , our newsletter, contributed birds for our raffles, and taught hundreds of children to carve soap. 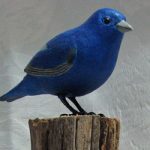 As Ingrid’s interests and skills as a wood carver grew, she became involved with the Green Mountain Wood Carvers, serving on their show committee and, in 2003, as their president. She was a member of the New England Woodcarvers and a guest lecturer at their annual meeting in 2005. 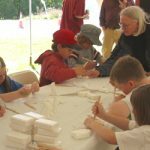 Ingrid held many wood carving demonstrations at the Museum and at wildlife festivals, welcome centers, art festivals, and other venues around Vermont. In 2009, Ingrid married fellow woodcarver Graeme Rhind (Bob Spear had introduced them), and left us to join him in Australia. There she joined the local wood carving group, demonstrated carving techniques at the Denmark visitor center, participated in a 4-day wood show, and experimented with local Australian wood (“It’s like working in cement”). She also carved a Western Rosella Parrot, sold to support a local charity. She continues to carve and seek out new birding experiences.